When molecules interact with the oscillating field of a laser, an instantaneous, time-dependent dipole is induced. This very general effect underlies diverse physical phenomena such as optical tweezers, for which Arthur Ashkin received the Nobel Prize in Physics in 2018, as well as the spatial alignment of molecules by a laser field. 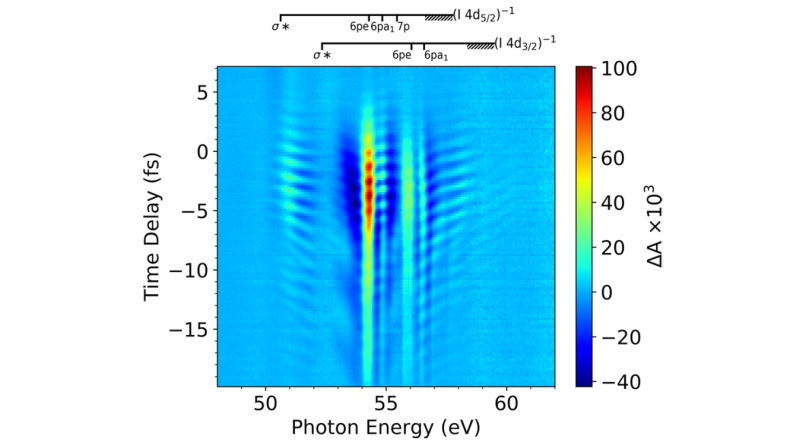 Now scientists from the Max Born Institute for Nonlinear Optics and Short Pulse Spectroscopy (MBI) report on an experiment in the Journal of Physical Chemistry Letters, where the dependence of the driven-dipole response on the bound state of an electron in an methyl iodine molecule is revealed. Fig. 1: Measured transient change of the XUV absorbance in the 4d-core-to-valence (σ*) and 4d-core-to-Rydberg spectral region in CH3I molecules. Pronounced sub-cycle oscillations at twice the NIR laser frequency are observed in the region of the core-to-Rydberg transitions, while the core-to-valence transitions are only weakly affected by the field. The observed effect is traced back to the higher polarizability of the Ryberg states, which makes them more susceptible to the interaction with the laser field.